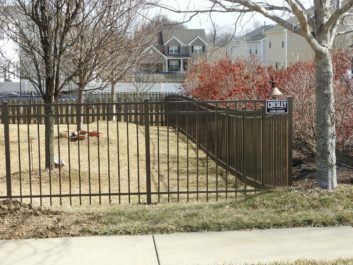 Would you like to have fencing installed in your Edwardsville, Illinois yard? Chesley Fence & Deck can help. 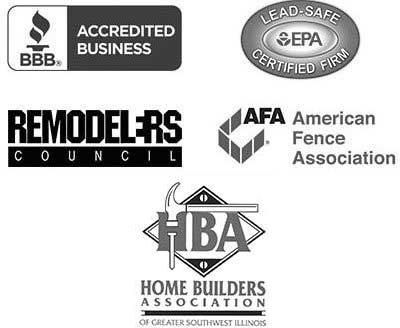 With decades of experience in the industry, we have the expertise to install your fence correctly the first time. We have even installed more fencing than any other company in the region, so you can rest assured we are the company to trust with your fence installation project. Western Red Cedar – Made from premium cedar that resists warping and cracking, our Western Red Cedar is one of the sturdiest and most durable wood options available. We also use true 2 x 4 rails to achieve greater stability in the fence. Aluminum – Our aluminum fencing undergoes an 11-step powder coating process to prevent flaking and has no visible rivets or screws for a flawless appearance. This option is also available with two-inch picket spacing rather than the traditional four to help keep pets and small children in the yard. Vinyl – The vinyl fences we offer to homeowners are made from the leading manufacturer, CertainTeed, and are more durable than most comparable products. This option is also low-maintenance and resistant to discoloration and fading overtime, so it will look beautiful for years to come. Each one of our premier fencing options is installed by our own experienced technicians, never subcontractors, who must uphold our strict professional and installation standards to ensure a flawless installation process. Our technicians can also install your fence in any configuration you desire to suit your lifestyle needs. For more information on the fencing available to homeowners in the Edwardsville, IL area from Chesley Fence & Deck, contact us today.